A 30 cm diameter pipe carries water under a head of 15 m with velocity of 4 m/s. If the axis of the pipe turns through $45^0$ Find the magnitude and direction of resultant force at the bend. Question: A 30 cm diameter pipe carries water under a head of 15 m with velocity of 4 m/s. 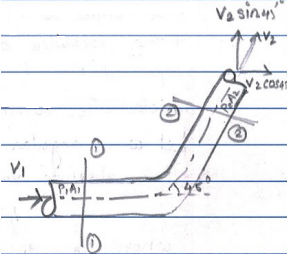 If the axis of the pipe turns through $45^0$ Find the magnitude and direction of resultant force at the bend.